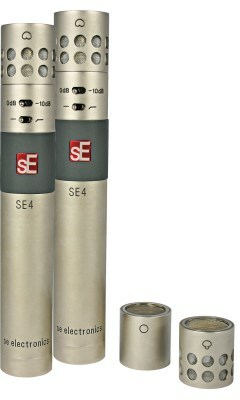 A matched stereo pair of sE4 mics with stereo bar and sE's new black Aluminium, steel reinforced, flightcase. The sE4 replaces the sE3. The mic is a remodelled sE3, designed to sound and perform exactly the same, and with very similar styling, but with one key new feature. The chassis has been re-engineered to accept 2 additional interchangeable capsules, a Hypercardioid and an Omni. The sE4 has been renamed, despite its similarity to the existing sE3, to avoid confusion, since the new capsules will NOT fit on the current sE3 model. Both single and matched pairs of mic and capsule sets will be available. The sE4 packaging has also been updated with sE’s new hi spec black Aluminium, steel reinforced, flight cases. All sE4 packages ship with full suspension shock mounts included.